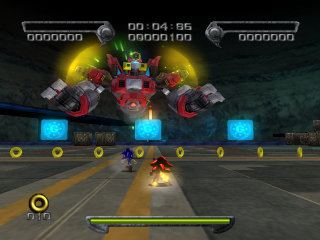 Sonic and Diablon is one of three possible final bosses in the main story of Shadow the Hedgehog, the other two being the Egg Dealer and Black Doom (boss). It is fought after completing the Dark mission in GUN Fortress, Black Comet or Final Haunt. The Diablon is an unfinished experimental half-humanoid GUN mecha, piloted by the GUN Commander. Sonic the Hedgehog teams up against Shadow in this battle, while Doom's Eye assists the Ultimate Lifeform as the companion character. Homing Attack: Sonic's only attack. It's unavoidable, but if you spin jump, or do your own homing attack, you'll remain unharmed when it connects. Antimatter Cannon: Like the other GUN mechs, it charges up for a powerful all-round attack, except in this case, it has a spherical radius, so staying out of its range is the only option. The charge is complete when the charging light becomes red. It's fired when he drops his shield. Blue shimmery light will indicate the outer area of the blast, so get past that, and the attack won't hit you. Laser Cannon: Its head also doubles as a laser cannon. While it's airborne, it'll only fire when you're up in the air, but after it comes down to the ground, the attack will be used regularly. Staying directly above him will make sure you aren't hit, and while on the ground, you shouldn't be staying in one place anyhow. This attack isn't used if you're in the range of his swipe attack. Swipe: Once Diablon's levitation unit gets damaged, it'll start using its right hand to smack you around when you're in range. Simply jump backward to avoid it. After this attack, he will stop dead for a second, so use this opportunity to get a homing attack in. 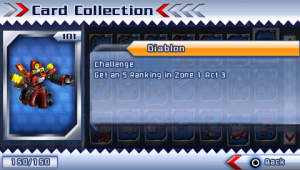 Diablon card from Sonic Rivals 2. Bashing Sonic is fun and all, but to empty the boss meter, you must attack the head. The problem is, Diablon's shielded. Lucky for us, it has to drop its shield to attack. While it's suspended in the air, it's also too high to reach, however, if you use a homing attack on Sonic, you can use it as a stepping stone to get close. Don't worry about the shield at this stage, Diablon will always use its laser cannon once you get high up, so you can always get some hits in. After he gets to the ground, the best opportunity is AFTER (not during) his swipe attack. In any of the cases, get a few hits in before he puts up his shield. A fully charged Dark gauge is your friend. As soon as the battle starts, look around the arena for weapon crates, and get a rapidfire weapon. First use homing attacks to get Diablon to the ground, then once it's down, use the weapon to get its health down quickly, but remember to only fire when its shield is down. Also, do NOT deplete your ammo supply. When you run low, resort to homing attacks instead. Then, once you've charged the Dark gauge, activate it and start shooting like crazy, without worrying about anything - you'll have unlimited ammo, and be impervious to any attacks. Don't use Chaos Blast; it'll deplete the Dark bar, and you can deplete Diablon's health faster if you just keep shooting. Breaching the Black Comet with Sonic the Hedgehog on the Pure Hero route, Shadow can pull an alignment reversal at the last instant and take the Dark option of raising the Comet's energy shields. On reaching Black Doom's sanctum and claiming the pink Chaos Emerald, Shadow is confronted by Sonic and the GUN Commander in Diablon; the black hedgehog explains that he has no particular sympathy with the aliens, but he'll side with whoever can take Sonic down! This is the route where Shadow allows his rivalry with his blue counterpart to define who he is, and on taking the final, red Emerald, the Ultimate Lifeform gloats about being the strongest hedgehog in the world. If Shadow's route takes him through the section of the Black Comet that GUN is attacking, Doom's Eye assigns him to defeat the invading army. Sonic and Diablon are reached at the end of this effort. Shadow demonstrates in this route that Doom's propaganda has thoroughly worked; humans are murderous vermin, who place no value on each other's lives. The Ultimate Lifeform resolves to become Black Doom's trusted lieutenant, using the Chaos Emeralds to help to conquer Sonic's world and realise the Black Arms' dream of empire. Taking the Pure Dark route, Shadow can bust into the humans' final stronghold and wreck the Mother Computers co-ordinating the remnants of the GUN army. After this boss, it seems all the turmoil in Shadow's mind has finally driven him to crazed omnicide. Not concerned with his own past, nor Black Doom's ideals of conquest, nor even personal power, the Ultimate Lifeform decides to do what Gerald Robotnik, in his Sonic Adventure 2 madness, conditioned him for: global annihilation. Shadow declares he will use the Chaos Emeralds to "destroy this damn planet!"